Odhinn Mikkonen, bard of the College of Metal. Welcome to Character Building Exercise, a feature about building characters for your RPGs. We’ll walk through how we created a particular character and solicit your thoughts on the build. This time around, we built Odhinn, a level 3 half-elf bard, for a Dungeons & Dragons 5th edition campaign. We used d20monkey’s new College of Metal subclass. I’ve always wanted to play a bard. Then I found out about the College of Metal at about the same time a pal was throwing together a new game on Roll20. 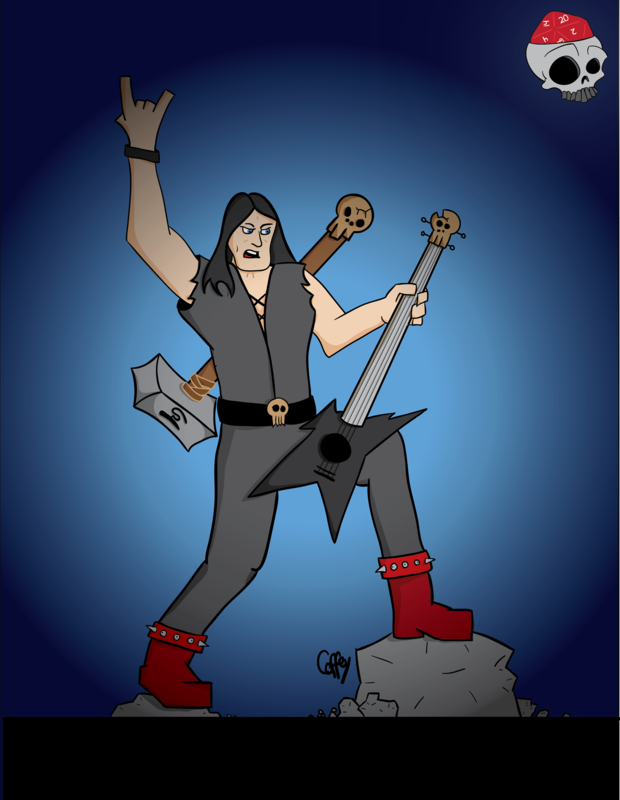 Rather than the usual effete bard lamely plucking away at a lute, the metal bard conjures thunder and death with his epic riffage. We didn’t have much of a backstory or setup for this game, but I wanted Odhinn to have a solid history. I gave him the 5e acolyte background, deciding that he was once a member of a large sect who was expelled from his temple. Odhinn then embraced metal, finding he could literally call down the thunder to strengthen his friends and lay waste to his foes. In 5e, you get all kinds of different background traits, but the two I’m focusing on the most are his bond, “I will someday get revenge on the corrupt temple hierarchy who branded me a heretic,” and his flaw, “Once I pick a goal, I become obsessed with it to the detriment of everything else in my life.” That should provide for some delicious roleplay. As for building his character, I made him a half-elf, granting a tasty bonus to his Charisma score. The College of Metal offers two disciplines: Disciple of Thunder and Disciple of Death. Odhinn is a disciple of thunder, which gains proficiencies with some pretty nasty melee weapons and allows you to use bardic inspiration dice to channel thunder damage to your attacks. The College of Metal also gives proficiency to intimidation and gives advantage on one intimidation check per day. That makes Odhinn something of a scary, badass, melee-centric bard, so his Dexterity and Strength scores are a little higher than you might otherwise expect. I also made his spell choices with his discipline in mind, so he absolutely has Thunder Wave in his spell book. And I’m looking forward to the future of the College of Metal. At level 6, he’ll learn Call Lightning and be able to use a bardic inspiration die to cast that spell at-will. At level 14, he becomes a metal god, gaining resistance to lightning and some big damage bonuses. Kudos to Brian Patterson for making such a fun subclass. I can’t wait to do more with this character. 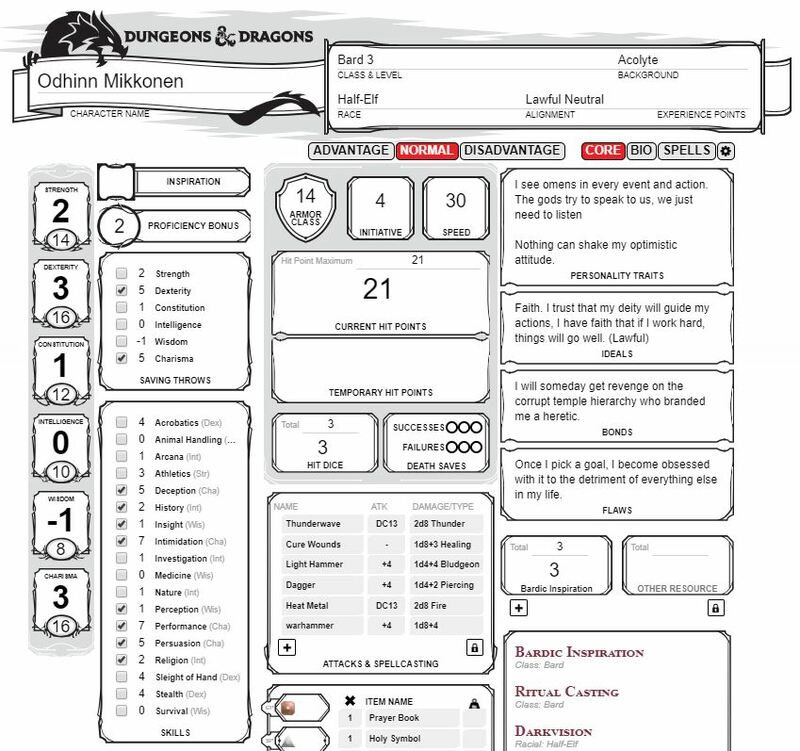 Check out Odhinn’s character sheet below and pick up the College of Metal at DMs Guild.